I didn’t purchase much on Black Friday 2014 but one of the few things I purchased was the LG Tone+ Bluetooth Headset. I had been eyeing them for several months and Best Buy was selling them for $39.99, which is considerably less than the MSRP of $69.99, so I picked them up. I have been using them heavily for the past several months and wanted to give my thoughts on them. 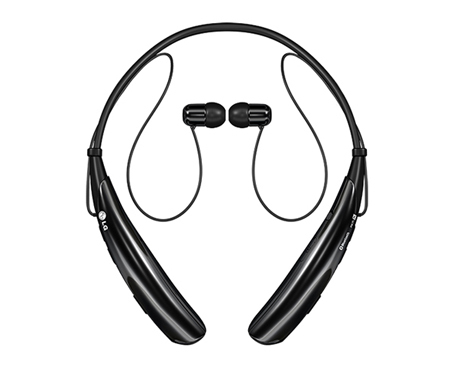 The LG Tone+ have a fairly unique design in that you wear them around your neck and the earbuds pull out and go into your ears. The neckband always rests on your neck and houses all of your controls. I really do like this design as your ears aren’t having to support hardly any weight. The neckband is comfortable, doesn’t bounce around much, and the earbuds magnetically attach to the ends of the neckband when they are out of your ears, which is a nice touch. I think the best way for me to do this review is simply list the pros and cons of this headset below. They can be connected to two devices at once. So if you want to be listening to music from your iPad and still have them connected to your iPhone for if a call comes in, you can. I really appreciate this feature. Call sound quality through this headset seems to be good. I use this headset heavily at work and answer and make 30 plus calls a day and I haven’t heard any complaints. The controls are well thought out and easy to reach. It took me just a couple of hours to memorize where everything is. The headset will vibrate when you are receiving a call which is nice if you are away from your phone and don’t have the earbuds in. I have been notified of several calls I would have missed because of this feature. They are very comfortable in my ears. They come with 3 sizes of tips for various ear sizes and I find them to be very pleasant to wear. Each time you turn them on they will tell you the battery level they are at. They also will show the battery level in the status bar on your iPhone. They will reconnect automatically if you go out of range as soon as you get back in range. You can activate Siri from the headset by tapping the call button. This is really handy. Sound quality is just average on this headset. Sure you can’t really expect incredible sound quality on a sub $100 bluetooth headset but I still wish it was a little better. This is not a deal breaker at all, especially as the majority of the time I am listening to podcasts instead of music, but don’t buy these expecting to have stellar sound. This headset looks a little dorky. I definitely have gotten some questions while wearing it. It’s not a big deal to me at all but if you are really fashion conscious you may want to look for something a little more casual looking. That about sums up my thoughts on the LG Tone+ bluetooth headset. Hopefully this will help you decide if you have been on the fence about them. For the price I got them at I highly recommend them. They are incredibly nice for my work and I don’t see myself going back to my EarPods anytime soon. You can find them on Amazon here.